I grow up loving durians. When I was a kid, we used to go back to Malaysia to visit my grandparents during the June school holidays. Coincidentally, June is also the durian season, so my grandfather would always bring back a huge gunny sack of durians on one of the days we were back. All of us (the grandchildren) would then sit around my grandfather, eagerly waiting for him to crack open the King of Fruit. Sometimes we wolf down the durians so fast that my grandfather couldn’t open the durians fast enough! As durians are very heaty, we would then mix tap water with a little salt on the durian husks and drink from there to cool ourselves down. Those were the days! Durian is a large fruit with strong odour and a thorn-covered husk. Some people regard the smell of durian to be pungent, overpowering, revolting, sewage-like, or even like rotten food, but not to me! I love the smell of durians, and though usually I want my fruits to be sweet, but for durians, I love it best when they are bitter – the more bitter they are, the more I love them! I’ve always preferred eating durian on its own – not in cakes, not in pancakes, not in mousses and not in ice creams – just 100% plain durian on its own. 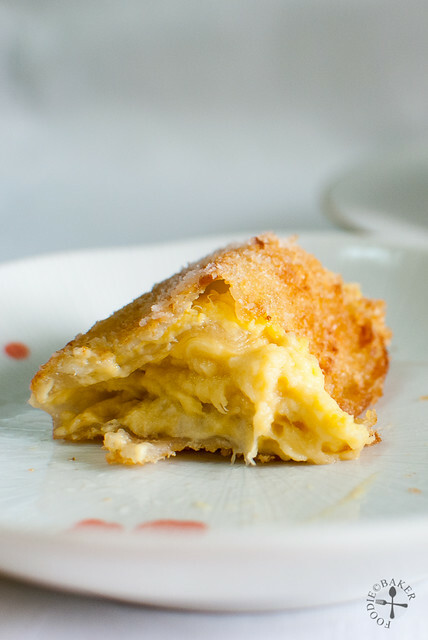 So for Aspiring Bakers, I wanted to bake something that will not dilute the flavours of durian, and I decided on this when my friend showed me the recipe on Yahoo! Makansutra. No baking or mixer is need for this recipe – hooray! 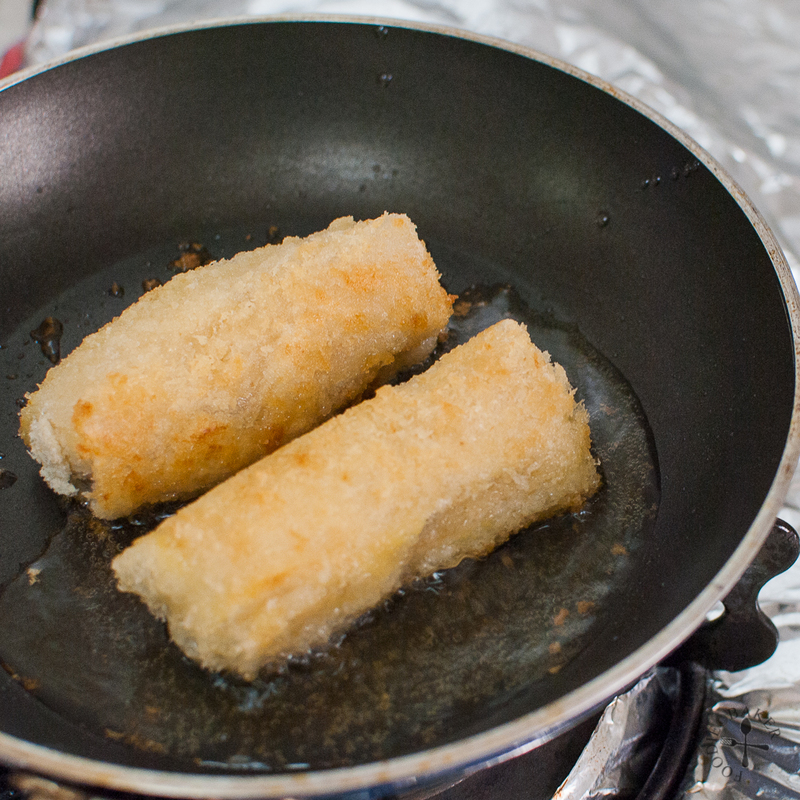 The durian flesh is wrapped in a thin rice paper, coat in flour-egg wash-breadcrumbs mixture, then pan-fried until golden brown. 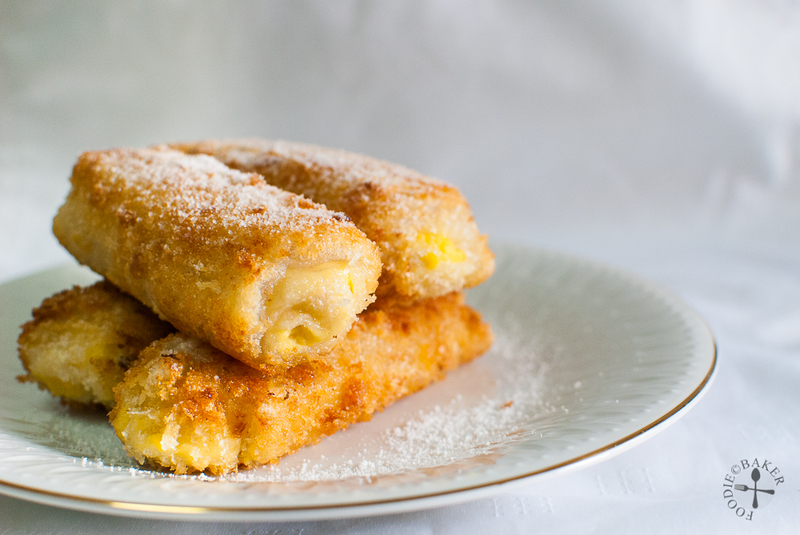 No cream or flour is added into the durian so the taste of durian is not diluted and I love the combination of the crispy breadcrumb-crusted roll, creamy durian flesh and the light touch of sweetness from the dusting of icing sugar. YUM! I will advise against eating too many at once though, as durian is very heaty and frying it only intensifies the heatiness of the overall snack! 1) Grab a rice paper. 2) Soak in warm water to soften. 3) Scoop some durian purée on top. 4) Fold up the sides. 5) Then roll it up! 6) Dip into some corn flour. 7) Then egg wash (I used only egg white). 8) Finally in panko. 9) Pan-fry in a little oil. 10) Drain on paper towel. There are only a few days left to this challenge, so do join us now if you have the time! If not, I’ll see you next month for the next challenge hosted by me – CHOUX! Now for the recipe! Combine durian purée and 1 tablespoon corn flour (optional) together in a small bowl. Refrigerate so that the purée firms up a little so it's easier to scoop later on (optional). Place remaining 1 tablespoon corn flour in a shallow plate. 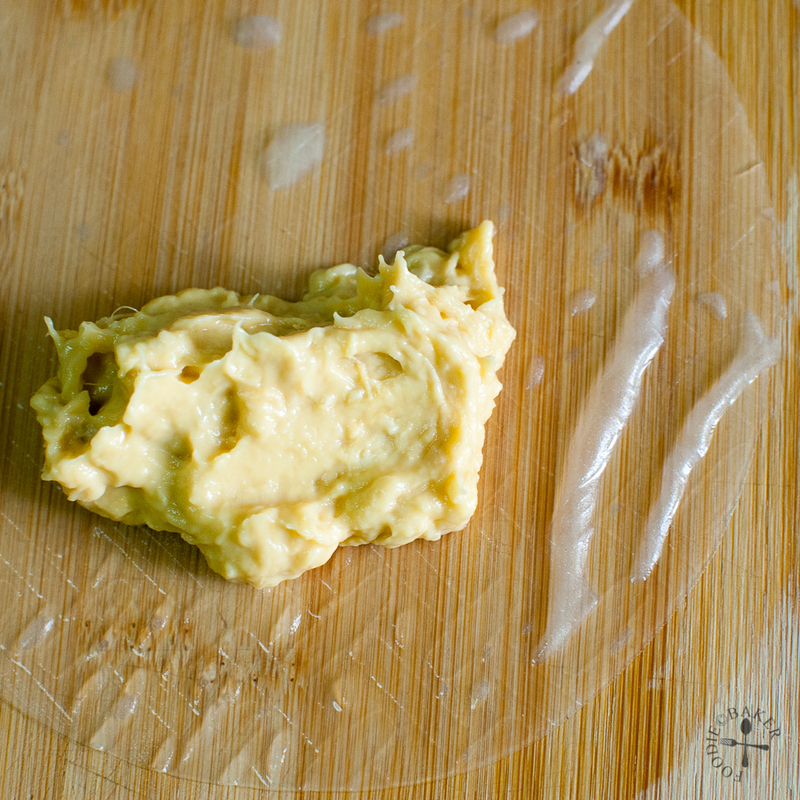 Combine egg and milk / water in another shallow plate. Place the panko in a third shallow plate. 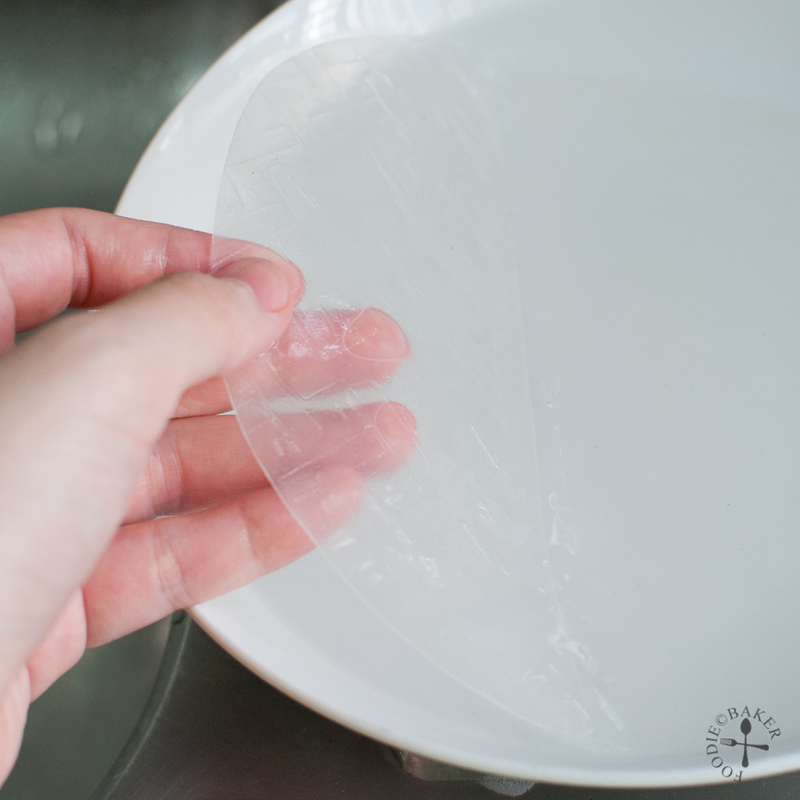 Dip the rice paper in warm water to soften, about 3 to 5 seconds. 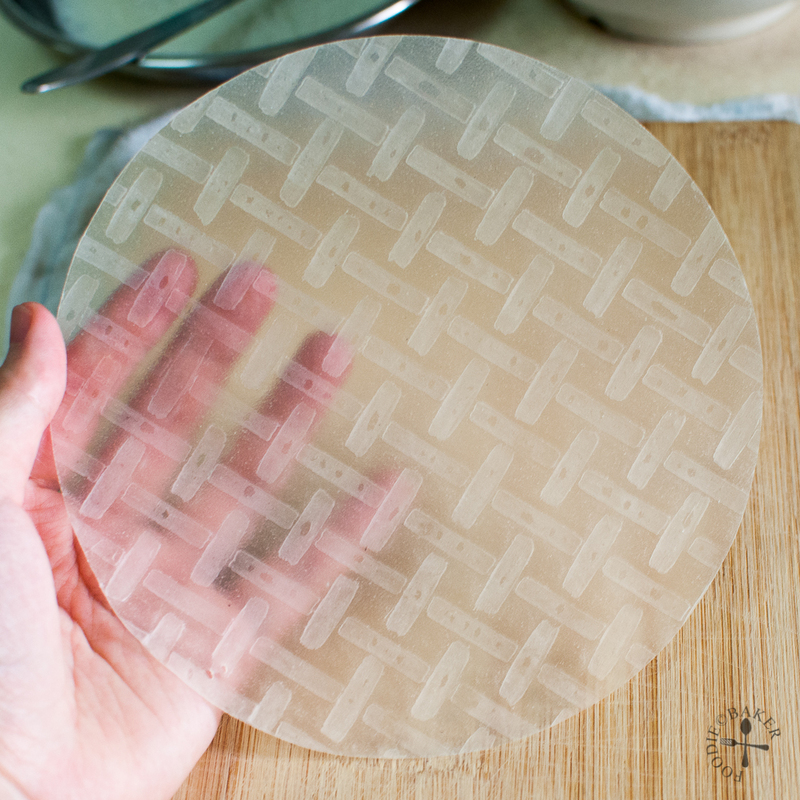 If you soak the rice paper in the warm water for too long, it will too soft and very hard to roll it up. 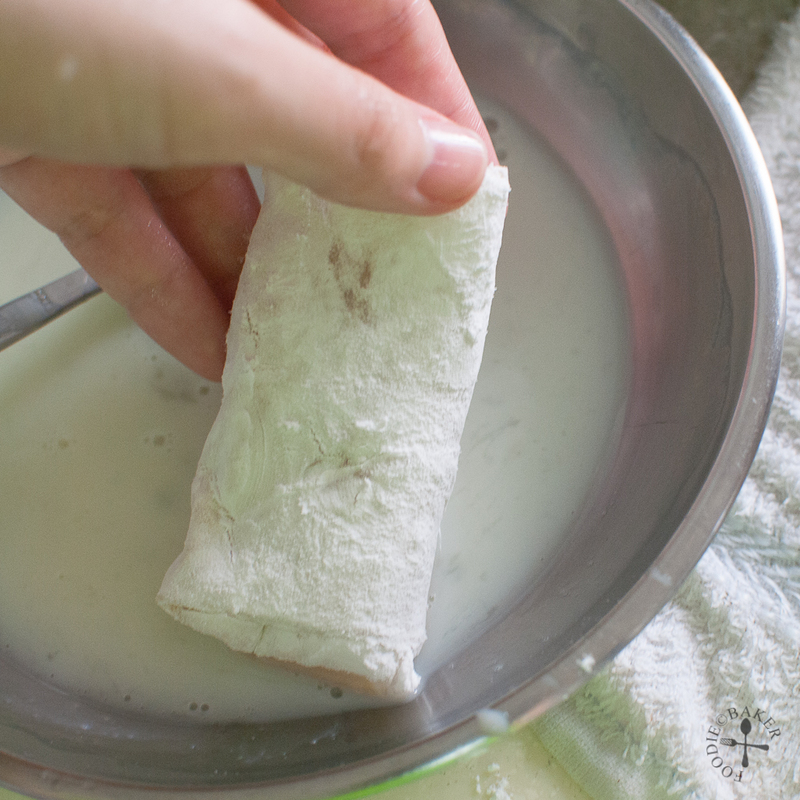 As you wrap the rolls, the rice paper will continue to absorb water. 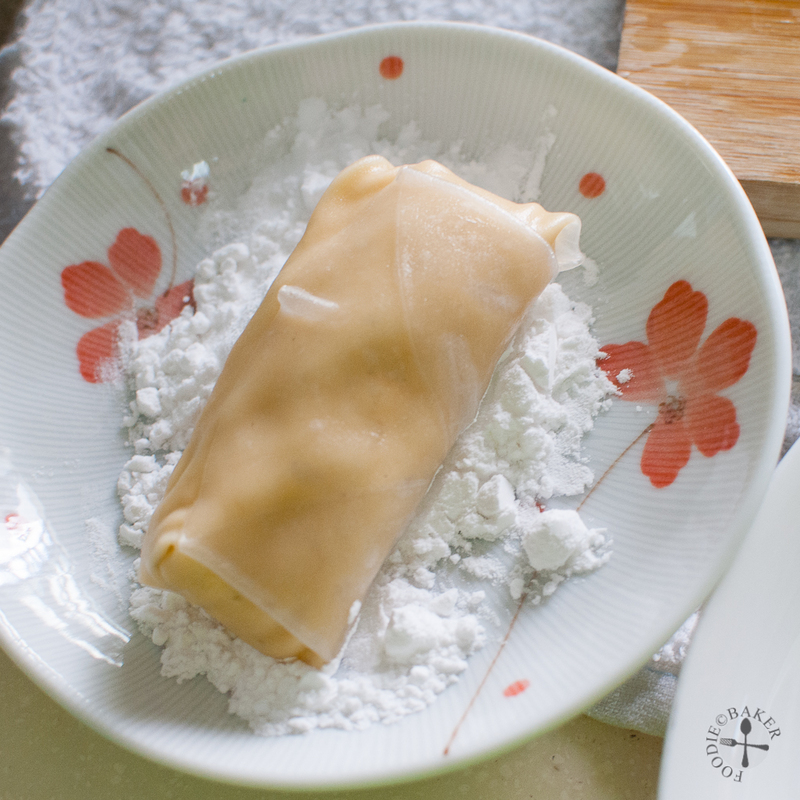 Scoop a huge spoonful of durian purée onto the softened rice paper, dab the edges with the egg wash, fold the corners in and roll it up into a roll. Place the rolls on cling wrap / greaseproof paper / clean, damp tea towel apart from one another to prevent the rolls from sticking. One of my rolls dried out and got stuck onto the wooden chopping board! 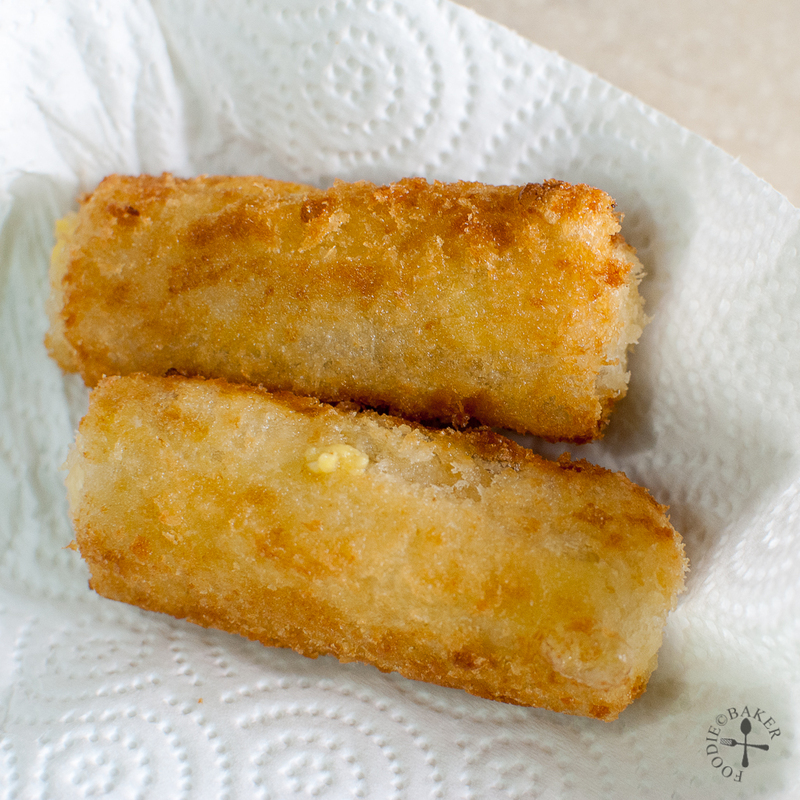 Dip the roll into corn flour, then egg wash and finally panko. Heat the oil over medium heat until hot (sprinkle a little panko into the oil and when it starts to sizzle, the oil is ready). Fry the rolls until golden brown, about 1 minute on each side. Drain the rolls on a paper towel. Transfer the rolls onto a serving plate. Dust generously with icing sugar and serve. I found the recipe provided by the author a little weird as 1 cup of durian purée was not enough for me to make 15 rolls – so I’ve adjusted the recipe accordingly in the one I provided below. Also, I didn’t mix in any corn flour or custard powder; didn’t freeze the purée (thought it’d make the purée too hard to be scooped out); and substituted panko for coconut (no coconut on hand). As this snack is a combination of a durian and frying, it will be extremely heaty, so do eat in moderation and drink lots of water so you don’t fall sick! 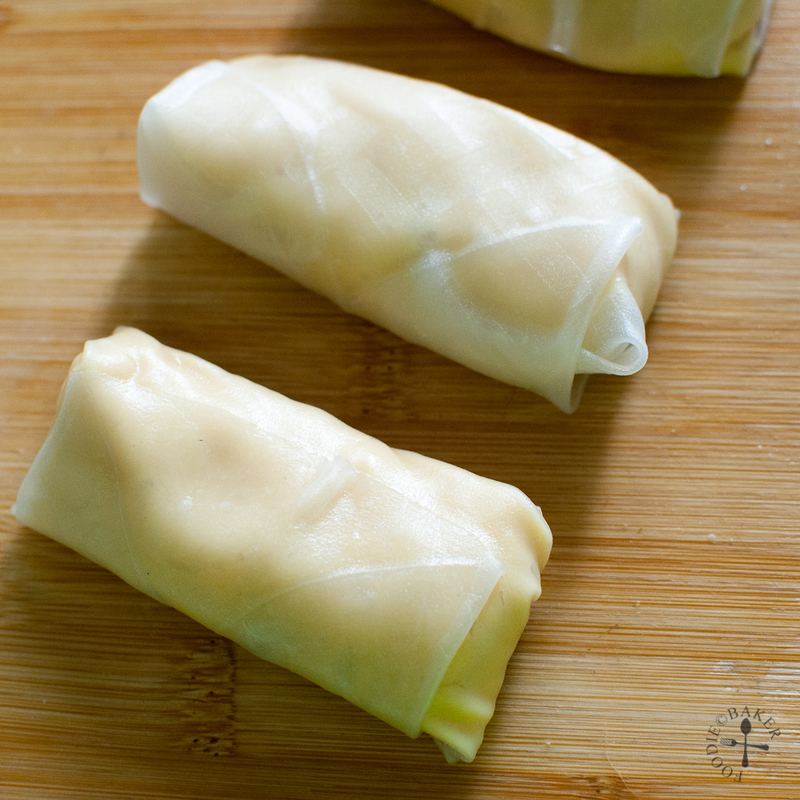 Substitute rice paper with spring roll wrapper – but you’ll have to fry the roll for a longer period. I wish I would be able to find a durian here just to see how they taste and smell 🙂 These crispy rolls would be a great idea filled with many kinds of fruit, I’m sure! I think it would be great if you’d like the fruit as well and I agree with you, a fruit compote would lovely to substitute durian for this roll! Thank you for stopping by my blog! Hi Jasline, thanks for the visit to my blog again! This is an eye-catching snack! I love durian but hardly eat any here though we can still get frozen imported durians from Malaysia & Thailand! Hmmm, I wonder need to also boil a big pot of “liang cha”herbal tea when making this or to eat with lots of mangoesteen too, hehehe! Hi Jessie! I think I’m still lucky to be able to enjoy durian fresh. Do they still taste the same after they thaw? Hahah I always just drink salt water after eating the durians, too full to be eating other fruits or liang cha! These rolls look so delish! This is definitely a new recipe for me, but I love making new recipes. Thanks for posting this. Hi Jasline, it is very creative to eat durian in a roll, is fun and I think the crispy outer will go well with the soft sweet durian too! Yum! Hi Tze, thank you very much! It’s very heaty though haha! So I didn’t dare to eat too many! Oh, this method of serving durian is new to me, look really tempting! is the rice paper taste crispy after fried? Hi Sonia! Thank you! 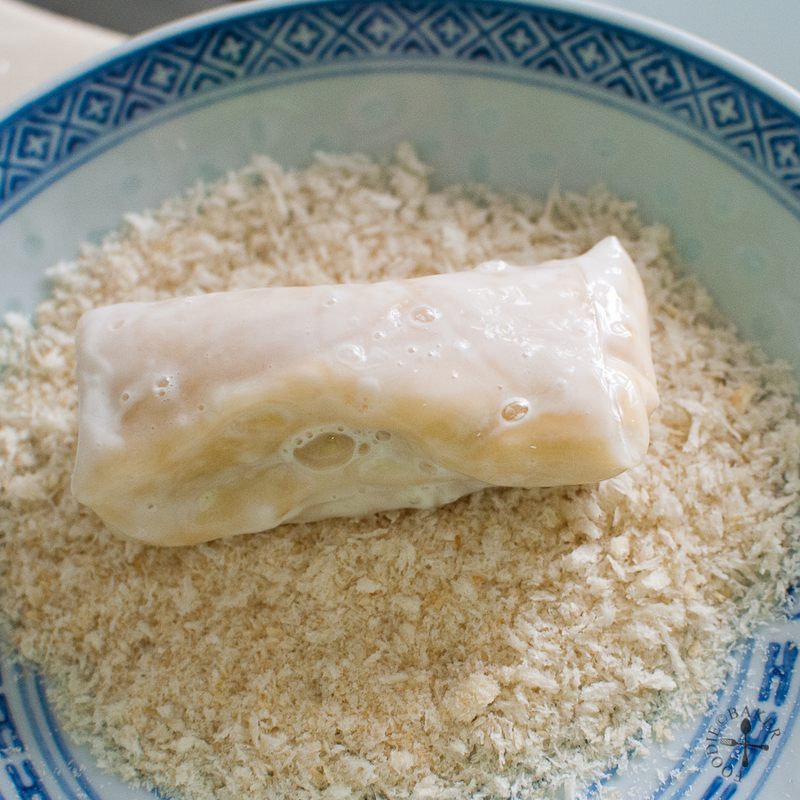 The exterior of the rice paper is crispy with the breadcrumbs, but the interior of the rice paper remained moist and slightly chewy as they are not exposed to the hot oil. 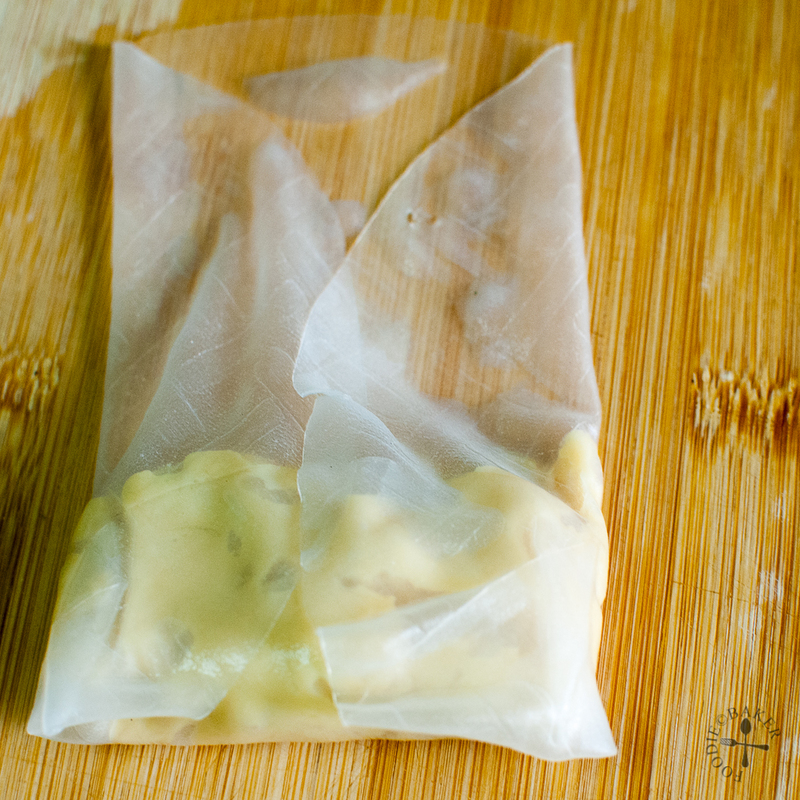 Spring roll wrappers can also be used instead of rice paper! Hi Phong Hong! Lucky my family love durians too 😉 Hope you’ll like these rolls! You amazed me with this fantastic idea. Didn’t know that rice paper skin can make such crispy and delicious fruity dessert. Hi Zoe, thank you very much for the compliment! Yes I am quite surprised too! Hi Juliana, I think I will try this next time with some mango cubes, sweet and crispy! Hi Ann! 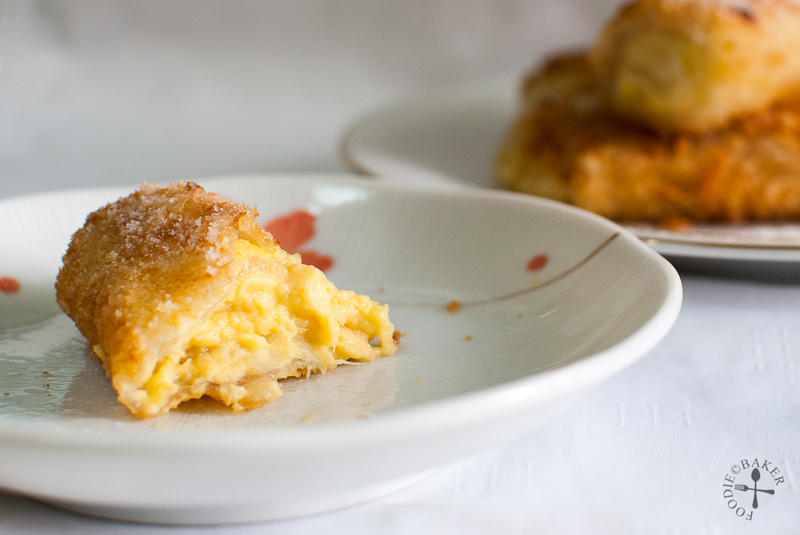 They are best served immediately – it was super sinful but super good 😉 Hope you’ll like it! oh my oh my! durian heaven! thanks for the tutorial! bookmarked! Oh wow! Send over a plateful please! We love durians, and like you, love it the best eaten them just as they are, and the bitter the better! Hahah I wish I can send it over but it’s all in my tummy now… (fattening!!) yes bitter durians are the best!